Devotees of tabloid weirdness will have to survive on the thin gruel sandwiched between celebrity divorces and miracle diets, now that the often-parodied but never equalled Weekly World News is shutting down. Here's the story from Reuters (which has occasionally ventured into WWN territory itself). The News was the only national publication to bring us reports of Bat Boy, the hole to Hell, and similar stories. What made it great was that the publishers obviously didn't believe a word of their nonsense. With the Weekly World News gone, we'll be left with nothing but humorless cranks for our fix of weirdness. It has been a busy week for Zygote's Science Guru, so she's taking the day off. Here are some useful resources on paranormal phenomena -- and by "useful," of course, I mean "blow apart paranormal claims like so many clay pigeons." CSICOP (the Committee for Scientific Investigation of Claims Of the Paranormal) is one of the oldest skeptic organizations, still fighting the good fight against all forms of quackery. The Museum of Hoaxes covers intentional deception, and is dedicated to celebrating as well as exposing clever hoaxes. Brian Dunning's Evil Skeptoid Debunkatron site features an archive of his entertaining podcasts attacking various forms of crackpottery and misinformation. His 'cast on "energy" should be required listening for everyone. Some strange sea creatures. Earth can boast things more alien than most movie monsters. Here's a slightly creepy image: the Japanese firm Tomy is creating cute little robots for adults to play with. They can expect a healthy market, because Japan's population has started to decline -- even though life expectancy there is among the highest in the world. They simply aren't having enough children. Robotics engineers in Japan have been addressing this problem with machines to care for elderly patients. One can imagine Tokyo in 50 years, with playgrounds full of cheerful frolicking little machines, watched by aged childless humans and their patient robot nurses. And 50 years after that, only the robots will remain. There will be no need for a robot uprising. The machines only have to be patient and let us die out on our own. 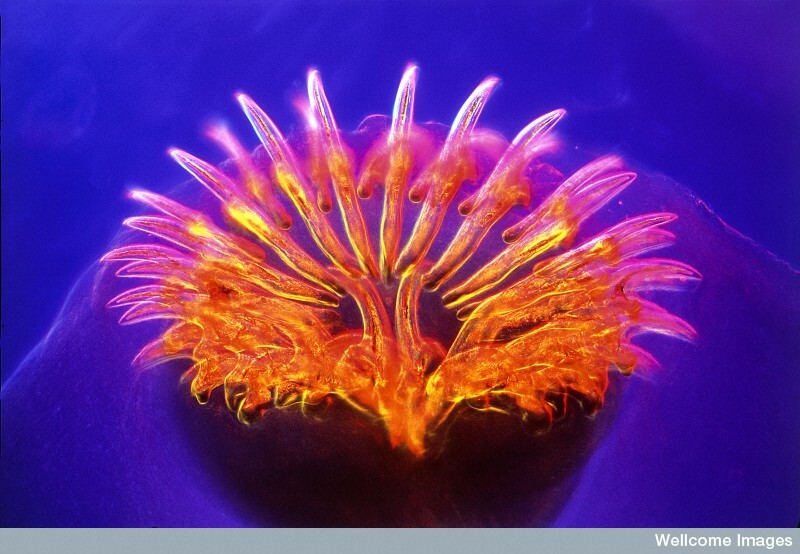 Last week featured a gorgeous picture of Taenia pisiformis. It’s a tapeworm which lives inside carnivores like dogs, foxes, and coyotes, hooked into the intestinal wall at its head and dropping egg-filled body segments called proglottids off its rear end. The tapeworm eggs leave a dog in its droppings but interestingly, despite dogs' appalling coprophagic habits, they don’t reinfect dogs directly. Instead, the tapeworm eggs attach themselves to blades of grass and wait to get eaten by a rabbit. In the rabbit, they hatch into a larval form, burrow through the rabbit’s gut, and attach themselves to the surface of its internal organs. There, they encyst themselves and wait for the rabbit to become prey. But rabbits don’t eat grass that’s been besmitched with dog poo. So how do the tapeworm eggs manage to get from inside the dog droppings to some clean grass a rabbit might find attractive? Turns out they come in a mobile container. After it’s dumped outside, the proglottid begins to crawl away. The School of Veterinary Medicine at the University of Pensylvania has a video of a moving proglottid that shows you how it works. It's worth checking out. The 84th edition of the Tangled Bank is now up at The Voltage Gate. There's a Greek theme. Spanakopita anyone? Some years ago, I had this idea for a children’s alphabet book about endangered animals. I researched it for a while, but I eventually abandoned the project because I couldn’t figure out how to make the book rigorous but not depressing. 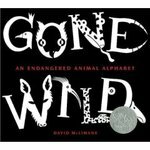 I’m glad to say that David McLimans manages to do both in Gone Wild: An Endangered Animal Alphabet. Thirty-eight years ago today, Apollo 11 lifted off for the Moon. That was the first time humans voyaged to another celestial body. It took the crew three days to get up to Lunar orbit, and the two-man lander touched down a day later. Thirty-four and a half years ago, Apollo 17 left the Moon. That was the last time humans voyaged to another celestial body. In those three decades, the massive ongoing expense of the Cold War ended, and the global economy has roughly tripled in size. Population has increased by about 50%, so on a per-capita basis we're twice as rich. The United States in particular is ten times richer than when humans last visited the Moon. So we could afford to go back. We've just decided it's not worth it. Before Copernicus, people believed the Earth was the center of the Universe. Evidently we haven't really learned better. Here’s my entry: it’s a light microscope image of the head of a dog tapeworm (Taenia pisiformis) showing a close up view of the hooks that attach the worm to the inside of the dog’s intestine. I’ve been a cyborg for six months. I mean that in the classic sense – where a cyborg (or a “cybernetic organism”) is an animal that also contains machine parts. For the past six months I’ve depended on a machine to regulate my metabolism. This isn’t some kind of bizarre weight-loss scheme. I’m diabetic. My machine keeps me alive. Here’s the story: three years ago, my pancreas stopped making insulin, and I started starving to death. I didn’t know it at first. I was hungry and tired because my cells couldn’t absorb glucose from my bloodstream; I thought my kids were just wearing me out. I was constantly thirsty because my kidneys were using enormous amounts of water in a desperate attempt to get rid of the sugar that built up in my blood; I thought the 90-degree summer heat was unusually oppressive that year. I had no convenient explanation for losing 30 pounds in three months. Fortunately for me, my doctor did. After he and all the nurses in the practice turned pale and rushed around for a while, I wound up with a blood glucose meter, a box of syringes, a couple of vials of insulin, and some basic training on how to use them. I was sick, I was never going to get better, and I had better get used to it. At first, I tried to manage my metabolism with regular injections of insulin. This is much harder than it sounds. You might think it would be a logical exercise: tot up the amount of carbohydrate in your meal, insert the corresponding amount of insulin under your skin, and everything stays perfectly normal. You’d be wrong. The sweet spot of “normal” is a moving target, affected by factors as diverse as the kind of food you’re eating, how active you are after the meal, whether you got enough sleep the night before, job stress, and (just to make things even more interesting) your daily and monthy hormone cycles. So as soon as I could manage it, I replaced my malfunctioning pancreas with an insulin pump.